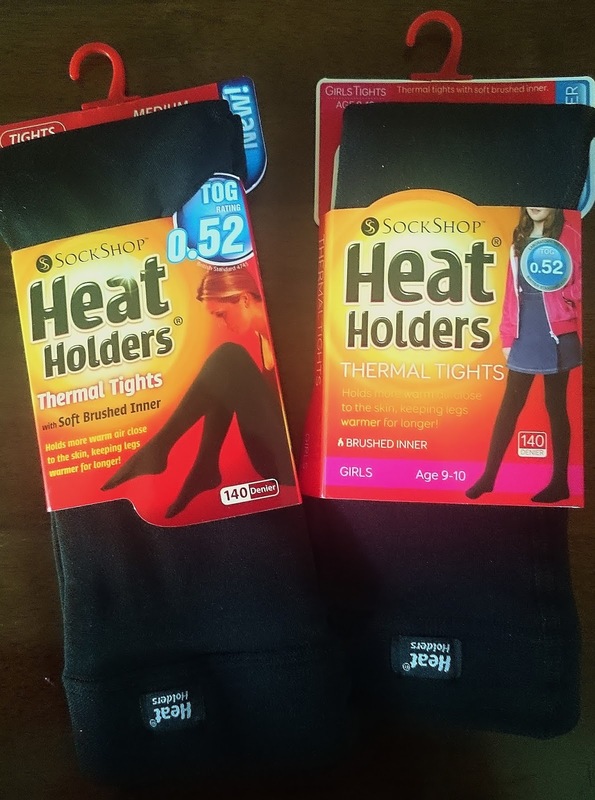 I am a huge fan of Heat Holders products and over time I have reviewed various items which I find to be cosy and very comfortable to wear. 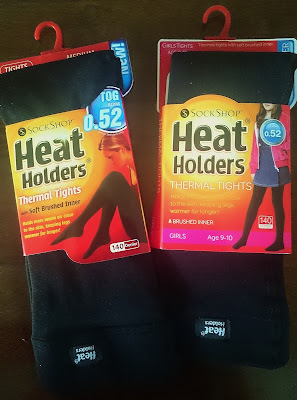 Recently my daughter and I were sent a pair of Heat Holders Thermal Tights and with Autumn on its way, there could not have been a better time. The tights we received were black and 140 denier, made from 91% polyester and 9% elastane. Heat Holders use a specially developed thermal yarn which provides high performance insulation against the cold, with a brushed inside which maximises the insulation. Now Grotbags has always had a thing about wearing tights, she never liked the feel of them against her legs but would quite happily wear leggings. When she tried on the Heat Holders tights I couldn’t believe my luck, she absolutely loves them and says "they are so comfy". This is great because I know they will keep her warm, especially as her skirt seems to be getting shorter. Apparently I’m not with it, how can she be expected to wear a knee length skirt! This is another battle I am now facing, when did it start to matter how long your skirt was to a 10 year old? I must admit I do agree with her about the comfort factor and will definitely be teaming my tights with my knee length boots, now that the chilly mornings have arrived. The tights can be washed on a gentle 40 degree cycle but cannot be put in the tumble dryer, although I found they dried really quickly over the radiator. We will be purchasing some more tights really soon as one pair is just not enough. The children’s tights are available in size 5-6, 7-8, 9-10 and 11-13 years priced at £7.19 per pair and the adult tights are in XS, S, M, L and XL priced at £7.99. We were sent this product free of charge for the purpose of this review but the opinion is entirely our own. Ohhhh how great will these be on those cold morning waiting for the bus to come :) I might have to order them! My daughter would love these, she gets so cold in the winter and insists on wearing a skirt to school. I love heat holders - I had a pair last year and I wore them to death. So cosy. These sounds great! I am always cold and I think that I would love these! I love Heat Holders tights, so warm and snug! Sound like a great idea! I always wear leggings over tights but have been feeling recently I'm a bit old for this so these sound like a fab alternative. Though I'm male, I LOVE wearing heatholders tights to practice ballet in. I also don't find myself in a hurry to take them off and like to wear them as leisure wear around the house.